Place tomato halves in 1 inch water in 1 1/2-quart saucepan. Heat to boiling; reduce heat to medium. Simmer uncovered about 5 minutes or until water has evaporated. Place tomatoes and remaining ingredients except yogurt and sour cream in blender or food processor. Cover and blend on medium-high speed until smooth. Place tomato mixture in medium glass or plastic bowl. Stir in yogurt and sour cream. Cover and refrigerate about 2 hours or until chilled. Serious calorie counters make this dip even lighter when they use fat-free yogurt and fat-free sour cream. 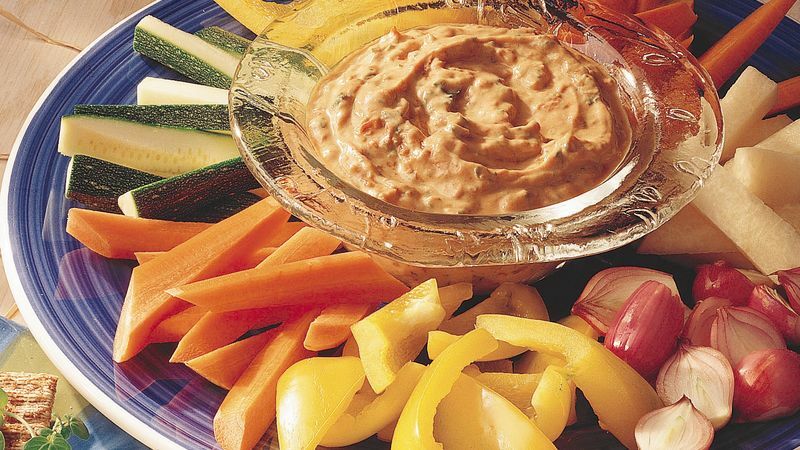 No self-respecting dip would be seen without an array of colorful cut-up vegetables, such as zucchini slices, red and yellow bell pepper strips and baby carrots.